March 22nd, 2011 (December 2010)– We arrived in Yaba-Talu for the evening which happened to be on Christmas Eve. By this time we had gained some elevation and were skirting the edge of the escarpment overlooking the vast plain extending into Burkina Faso. I went for a stroll from the village to the edge of the cliff to have a look. I was hoping there might be a place to camp nearby but it turned out to be less than ideal. On the way I mistakenly walked through a burial site. I only found this out later when Leslie walked into the area and was informed of the significance by some young girls who pantomimed the 'cut throat' motion to indicate the site's significance. I guess that's what I get for exploring solo. Dummy. The next morning the small village was awash with activity. It was Christmas day and some of the local men wanted to get started early…with rum. Actually, I'm pretty sure their Christmas began the night before. Gotta love the Christians. We pressed on. By midday we arrived at Nombori, Gabriel's village. The walk took us through a small canyon and was, by far, the most topographically interesting area we had passed (I got a little lazy with the camera). I had hoped we would see more of the same. After arriving at Nombori we began our lunchtime ritual of sitting and staring. By this time both Leslie and I were not such happy campers. As boredom set in our morale dampened. We hated to admit it but the trip was going the way we'd hope it would not. Insipid would be a good adjective. And on top of that we were not really feeling that great, a condition probably related to the heat and the dust. Things brightened a bit when Gabriel invited us to visit the local church to witness the Christmas festivities. I investigated alone as Leslie was not feeling up to it. It was to be the most rewarding experience of the trip for me. The 'church' consisted of a large wooden hut filled with benches. It was packed. Everyone was dressed up. At first I stood in the doorway and listened to the congregation sing religious hymns in their local language. Magnificent. Although hesitant at first Gabriel finally coaxed me into the back where I squeezed myself onto a bench and enjoyed the proceedings. It would have been impossible for me to stick out any more than I did. I felt privileged to be able to sit back and watch these folks worship with all the alacrity of devout believers. In between songs the preacher would give a sermon that everyone was glued to. The highlight was the children who at one point piled into the open space near the door and began bellowing a religious hymn. This may not have been the Dogon I was hoping to see but it was delightfully authentic. I parted with a smile on my face. Of course, I forgot to bring my camera. And then came lunch....and more sitting. We had hoped to visit Gabriel's home but an offer never materialized and when he said he was going to his house I felt asking if we could join him would be a bit impertinent. I don't think he spends that much time with the folks so I can certainly understand his wish for privacy. In his absence Leslie and I had a 'Come to Jesus' moment about our trek. We simply had had enough. 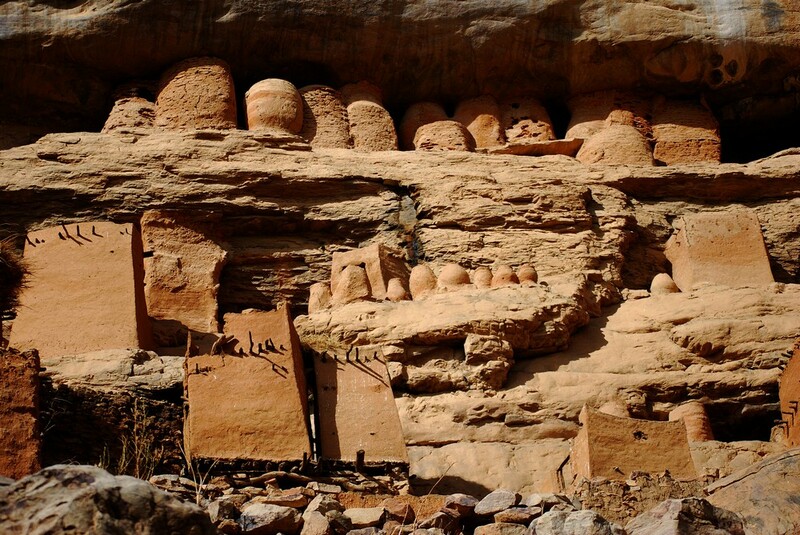 I am certain a trip to Dogon could be worthwhile with a bit more planning and research. 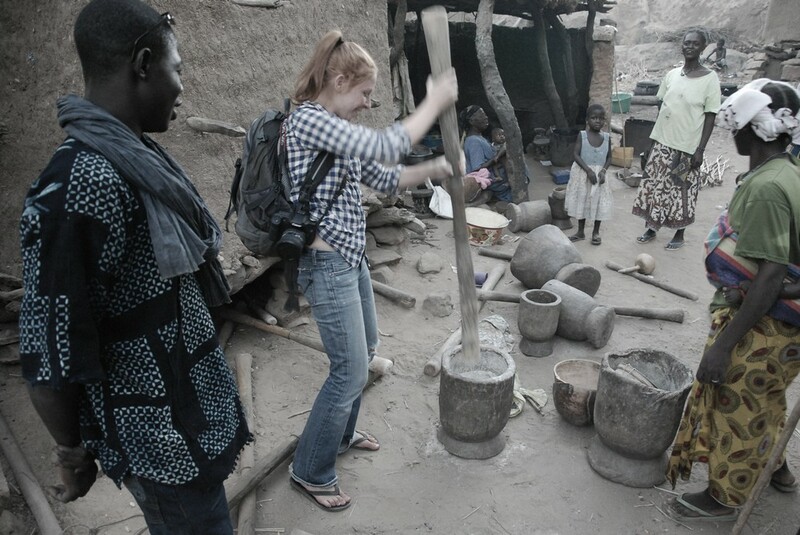 Firstly, I would try to bring along someone versed in Dogon culture with ties to the community. A cultural anthropologist would be ideal although finding one might be a teensy bit problamatic. I do not blame Gabriel. It would be easy to chalk this up to a poor guide but my instincts tell me he is the norm. The fact is daily life in these villages is probably not terribly interesting outside festival/ceremony times (unless you are in a group and pay to see a ceremonial reenactment). And some ceremonies are off limits to foreigners anyway. Tourists have been visiting the region for many years and as a result of this we were regarded with a sort of mild apathy (the exception being the small children). Can't blame them for that either as I am sure I would be the same in their position. Still, it does not make for a very engaging experience. I also believe that the majority of tourists are content with the exact program that so bored us to tears (i.e. a snail's pace with long breaks in between). This was certainly the case for the two Chinese woman Gabriel had just escorted. 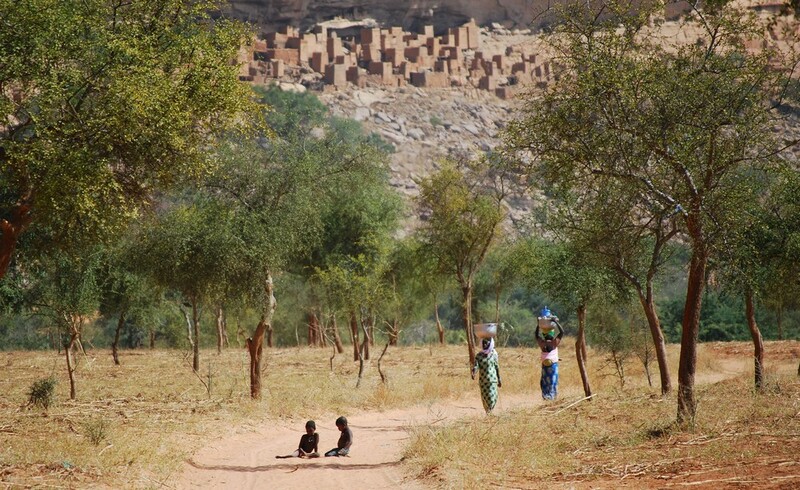 I would surmise that if you are in relatively good shape you could probably walk through the heart of Dogon in four days (as opposed to eight) at a comfortable pace. I mentioned this to Gabriel and although he thought we were 'very fast' balked at such an absurd suggestion. Uh-huh. Additionally, the whole trip can be done in a vehicle which may in fact be cheaper (less time). I love hiking but prefer to do so when it is necessary to enhance your experience. I am not so sure this is the case in Dogon. So after a bit of deliberation we decided we would head back to the village we'd passed through the day before (Yawa I believe) where we could theoretically have our driver pick us up and bring us back to Mopti. Gabriel invited us to see a group of folks engaging in a bout of singing and dancing (more Christmas celebration) at the bottom of the village (we had been hearing them for hours). It was my turn to feel ill so Leslie went without me. Apparently I made a mistake as it was a fascinating experience. On the way back Leslie broke the news to Gabriel. He did not take it well. In fact, when they returned he pulled up a chair next to Leslie and I and appeared to sink into a funk. We felt terrible about this but could see no alternative. 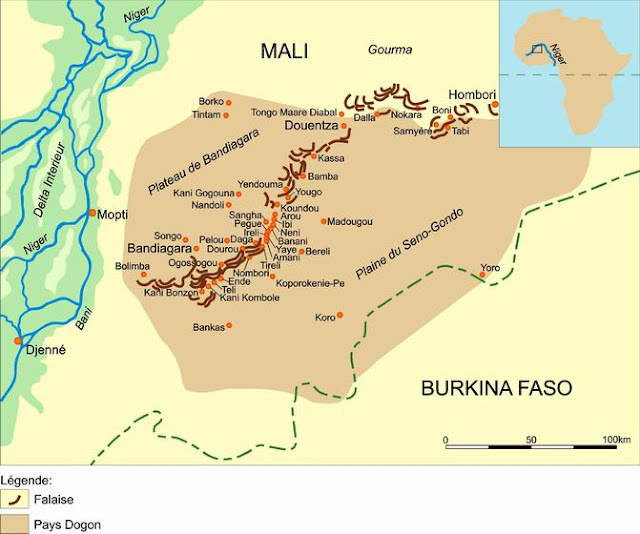 We softened the blow a bit by informing him and our hosts that we were not feeling well and needed to return to Mopti. They interpreted this as weakness and our inability to adapt to the terrain. In their view we simply pushed ourselves too hard. In some of the pictures that follow you will notice dwellings built right into the cliff face, many of which are impossibly high (meaning no apparent access). 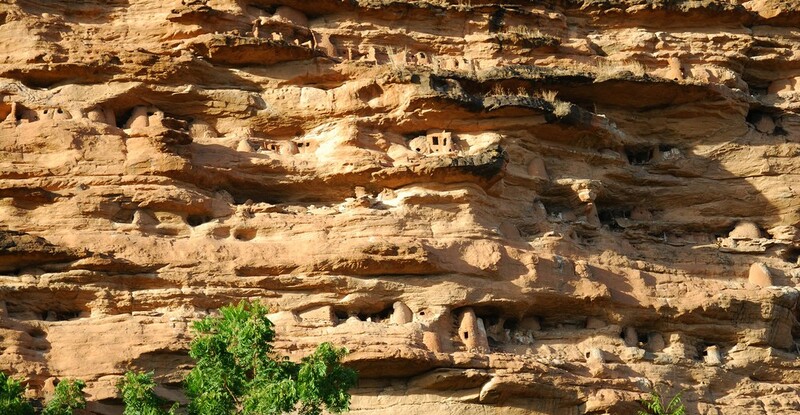 These do not belong to the Dogon but are instead attributed to the Tellem, denizens of the escarpment prior to Dogon settlement. The Tellem were reputed to be pigmies that either assimilated into Dogon culture or disappeared from the region altogether. No one seems to know. 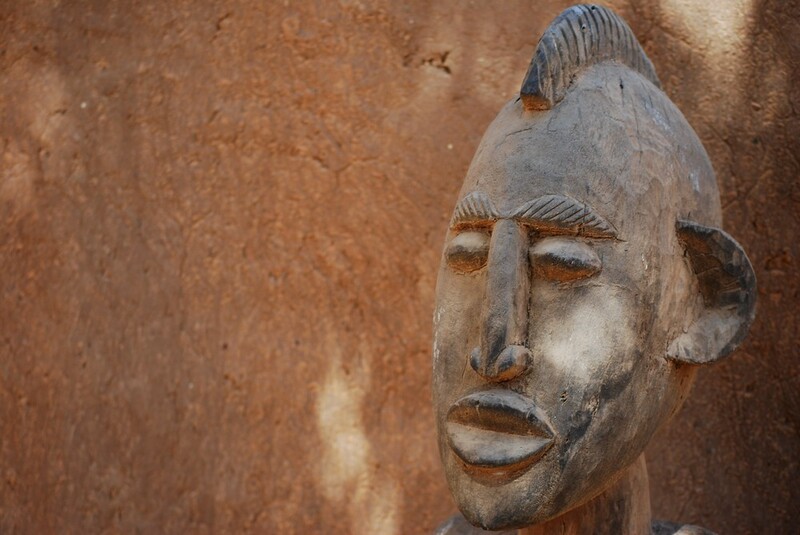 The Dogon believe that these folks had magical powers, most notable the power of flight. This helps explain their precarious dwellings. I was not able to find out much about this ancient culture online so if anyone has anything to add I am all ears.